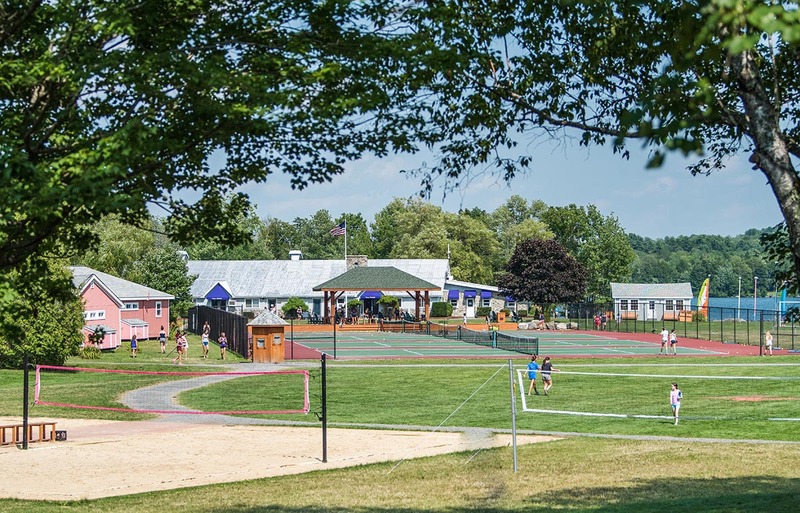 Camp Matoaka is located approximately 3 hours from Boston and 1 hour and 20 minutes from Portland. It is situated on East Lake, in the Belgrade Lakes Region. We know that to be an effective counselor, you need to take time for yourself. Every counselor is given 6 days off during the summer, as well as 1 day off during staff training, for a total of 7 days off. When counselors are not on-duty in their cabins or at an activity, they are free to relax on camp or off-camp. The Staff Lodge, complete with a kitchen, big screen television, Wifi, movies, games, etc., is a favorite spot for staff to relax, enjoy time together and recharge their batteries. Our staff should be clean and tidy at all times. Whenever they are in camp or out-of-camp with campers, our staff wear Matoaka Staff shirts. Matoaka provides optional laundry service for our staff for a nominal fee. Most female staff live with the campers in the cabins. The cabins are spacious and modern, and are equipped with electricity, smoke detectors, fire extinguishers, and full bathroom facilities. In most cases, counselors sleep on the top of a bunk bed. Each counselor has a dresser with 4 drawers and there is ample space for hanging clothes within the bunk. It doesn’t get any better. We have spent a considerable amount of time perfecting our menus to make them fun and nutritious. We have fruit, salad, sandwich, and hot pasta bars as alternatives available at lunch and dinner. Matoaka offers gluten free, vegetarian, vegan and diary free options at each meal. What if I get sick at camp? A Health Care Manager and five nurses staff the Health Center. The Health Center can administer all common over-the-counter medications and there is no charge for this service. However, if a counselor doesn’t feel well enough to perform her job, she will go to the local Urgent Care Clinic in town to be evaluated. Camp sounds great, but really how much work is it? Camp life is very demanding. Our responsibility to our campers is 24 hours a day. If you are interested in joining our staff, please consider all the information carefully. Contact us via telephone or email and we will get in touch with you right away about the availability of a position and arrange a telephone conference about the possibilities of being a counselor at Matoaka. Where can I go on my day off? Maine is called the “Vacation State.” There is plenty to see and do on days off. Here are a few favorite places that are always popular with Matoaka counselors: Freeport: The outlet shopping capital of the world, with everything from Ralph Lauren, Calvin Klein, Timberland, Gap and Banana Republic to the world famous L.L. Bean. Only 1 hour drive from camp. Portland: Maine’s largest city, it is a combination of malls, bars, great water front restaurants all mixed up with a lot of character and atmosphere. Bar Harbor/Acadia National Park: A favorite with counselors for many years. The town of Bar Harbor is located within Acadia National Park. It has great seafood restaurants and shops. Or spend a day in Acadia, either walking, mountain biking, kayaking or climbing. The Kennebec River: For the adventurer inside us, why not try white water rafting, a great way to spend a day off. Don’t forget we are only 4 hours from Quebec, 5 hours from Vermont and 3 hours from Boston.